The Norse gods cry too, sometimes. This is a really, really sad story, about how a favourite son of the gods met his end. Loki, the god of fire had a hand in it. Perhaps this time Loki went too far with his tricks. Read by Elizabeth. Written by Charlotte Sebag-Montefiore. Proofread by Claire Deakin. My name is Frigga, you must have heard of me. Once I had it all. I was wife of Odin, and Queen of Asgard. Our palace was made of gold and had 540 rooms. There was a fair bit of politics and debating that went on there, but we gods spent most of the time feasting and playing games. You might say that I lead a privileged life. But the joy and happiness in my heart did not depend on luxury or advantage. I was a mother and I had two splendid sons: Hodur and Baldur. Both Odin and I counted our boys as our greatest blessings. They were twins, but they could not have been more different from one another. Baldur was all radiant beauty. He shone with innocent happiness, and was as beautiful as a sunbeam. Everyone who saw him loved him right away for the lightness he brought into their hearts. Hodur, however, was the very opposite. Not only was he dark but he was blind. The poor boy could share none of the delights of light. But you had to admire the way he just quietly got on with life. I loved him all the more for it. I said that everyone loved Baldur, but there is always an exception. In this case, that was Loki, the god of a different sort of light – fire – and the god of a different sort of pleasure – mischief. He saw how popular Baldur was, and he was filled with envy – though he did not show it. He waited for his opportunity to put out the light of his rival. I can’t say that we were not warned. Baldur started to change. The light in his blue eyes was a touch dimmer than usual. He hung his head and looked weary. I began to worry about the boy and I spoke to Odin. “Don’t fret, it’s probably just a phase he’s going through,” said my husband. But mothers do fret. And so when I was alone with Baldur, I asked him as tactfully as I could, if anything was the matter. This was not the news I wanted to hear. When we gods dream, it is usually prophetic. And so I spoke once again to Odin, and we both became uneasy and started to sleep badly ourselves. Even Odin began to have dark dreams. These kinds of moods and depressions are infectious, you know. But the all-seeing Odin did not know what to do. When it came to saving his own son, he was struck with indecision, and just fretted and worried. At last, my husband was also spurred to action. He saddled his horse, the eight-legged Sleipnir, and rode in a flash to consult a prophetess in the underworld. This was not the burning hell of Christians, but in the cold, dark place of the dead. To his surprise, Odin saw soft silken couches, surrounding a magnificent feast, as if a guest or new arrival was expected. His heart grew heavier and he summoned the prophetess with his spells. “The same,” said she. “It is his brother who will slay him. And you, Odin, will bear a son to avenge his death. Now let me sleep again.” And the prophetess sank back into her tomb. Odin rode home to Asgard. His heart was heavy, thinking of the loss of his son, and the light and love of his presence, but Sleipnir galloped home at a tremendous pace on his eight legs. In those days, life in Asgard was really fun. The gods were always teasing one another and having fun. Now there was a new game. The word got around that nothing could hurt Baldur, and so everyone decided to try out his invulnerability. All the young gods – and because we all ate the apples of immortality, we were all young (except for Odin who kept a grey beard for gravitas) – formed a circle, and Baldur went in the middle. Everyone took it in turns to throw things at him, but because all the world had promised not to hurt him, these objects made strange patterns in the air, loops, spirals, simple detours, and never touched him at all. Of course, Thor did not throw his hammer, for that had its own magic. However hard the gods threw their weapons and things, however carefully they aimed, nothing would touch my Baldur! He chuckled and challenged them to try harder. I kept my spinning wheel in the corner of the hall. Like all mothers at that time, I had plenty of spinning to do, so I remained behind. I wondered what all the laughter and noise was about. An old woman started to clear the tables. “Do you know,” I asked, “what is going on?" There was a crackle in the fireplace, which was a clue that I should have spotted, but the whirr of my spinning wheel, and my need to keep an even thread, kept it from me. For the old woman was Loki – ever the master of disguise- creeping about to learn what he could. “It is the gods at play,” said Loki. “They throw all manner of things at Baldur, but nothing will touch him." “Ah, that is because everything on the earth has promised me never to hurt him," I said. Oh woe is me! I should have held my tongue. “Well not the mistletoe,” I told him, babbling on like a fool. “It grew too high, and it’s not much of a plant, is it? No branches or anything." The old woman said nothing and finished clearing the tables. I saw that she was working quickly. Loki left the hall and hurried outside. He knew there was an oak with mistletoe by the gate. He managed to pick some, and with his magic spells, first strengthened the mistletoe and then made it into an arrow. A smile played on his lips, and there was evil in his heart. Following the sound of the laughter, Loki walked over and joined the merrymakers. Hodur stood apart, sadly. “Hodur," he said, "wouldn't you like to have a turn?" “Do not mock me," said my dear Hodur. "How can I aim when I cannot see?" “I will be your eyes,” said Loki, and he took the arrow and placed it in Holdur’s hand, drawing it back carefully. “Let it fly.” The arrow whizzed through the air and hit my Baldur! There was no laughter, only silence before a terrible cry, for my Baldur, the Light, fell dead to the ground, his heart pierced by the fatal mistletoe. “The blood price, vengeance, the blood price!” came their words… and indeed this was our ancient custom. They would have slain Hodur there and then, were it not that killing was not permitted in Asgard, not that Loki paid any attention to that rule. Oh the mourning, the wailing and keening! The goddesses came to see what had happened in the hall. I too, and when I saw, I rent my robes... “Oh Baldur, you are no more!” I said, and beseeching the gods, I continued, “Go, go to the underworld and beg for his release, for I and all the gods and all the earth cannot live happily without him. It was Hermod who was willing to go. The others were afraid. My Odin prepared his own Sleipnir for the journey – and off he galloped. 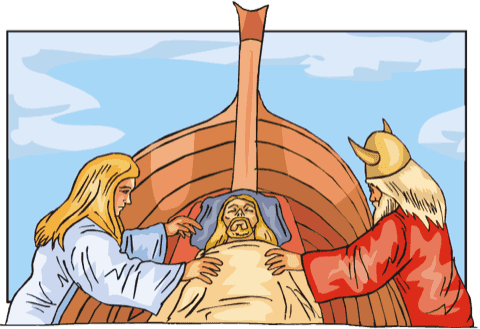 While he was gone, we prepared a funeral ship for Baldur, as is the Norse custom. We garlanded the boat with flowers, thorns and tapestries, and laid my darling son upon it. Around him we placed all his possessions: his swords, shields, plates, and goblets, the saddle of his horse, and even his golden throne. Odin himself whispered a few words to his dead son, before placing his magic ring Draupnir upon his lifeless chest. It was his favourite treasure. There were rollers beneath the boat, and we set them alight. The all consuming flames of death began to lick the hull. Thor laid his shoulders into the back of the burning boat, and started to push – but it was so heavy it would not shift. There was no time to lose. Right away Isent my messengers whirling around the world. Each and every living thing began to weep for the loss of the lovely Baldur who brought such joy and light to one and all – but as I said before, there is always one exception. One giantess, Pokk, refused to mourn my son. His fate was sealed. Now we had to return to the business of pushing him out to sea. Fortunately, not every giant is as hard hearted as Pokk. Another giantess was watching us from a hill top. She came down to the beach, riding on a wolf, with a bridle made of wriggling snakes. UGH! What a horrid sight she was. And that was Baldur’s Death: a Mother’s Lament, written for Storynory by Charlotte Sebag-Montefiore. And you might like to know that Charlotte has written some verses which tell tales from the Old Testament. They are called Rhyming Bible Stories, and they are available from Amazon for Kindle, and will soon be in paperback too. They are published by Storynory. Why was Loki jealous of Baldur? Who was responsible for Baldur’s death? What do you think about the relationship between morality and the law? Do you think that Baldur and Hodur symbolize the changing seasons for the Norsemen? Which is your favourite season and why? Did you like this story? Please write in English. Comments are moderated. Total agree!! But that giant was so rude!! And so was LOKI. Second to comment! I Love this story. It truly Is heart touching,THANKS Bertie! Dear Keiran, I’ve now written two more Astropup stories, and am working on a third. We can’t record them with Richard until I get back from holiday. One is called the Parrot’s Revenge, the next is called The Wreck of the Hesperus, and the third is called the Planet of the Pirates…. the names might change a bit, but those are the ideas. when are you going to post them bertie? WHAAAAAAAAAAAAAAAAAAAAAAAAAAAAAAAAAAAAAAAAAAAAAAAAAAAAAAAAAAAAAAAAAAAAAAAAAAAAAAAAAAAAAAAAAAAAAAAAAAAAAAAAAAAAAAAAAAAAAAAAAAAAAAAAAAAAAAAAAAAAAAAAAAAAAAAAAAAAAAAAAAAAAAAAAAAAAAAAAAAAAAAAAAAAAAAAAAAAAAAAAAAAAAAAAAAAAAAAAAAAAAAAAAAAAAAAAAAAAAAAAAAAAAAAAAAAAAAAAAAAAAAAAAAAAAAAAAAAAAAAAAAAAAAAAAAAAAAAAAAAAAAAAAAAAAAAAAAAAAAAAAAAAAAAAAAAAAAAAAAAAAAAAAAAAAAAAAAAAAAAAAAAAAAAAAAAAAAAT ? IT WAS PERFECT ! mushy and sad. i feel bad for them, especially the blind guy. i like this story very much.thank you! Thanks elizabeth for the heart touching story I can’t wait for the next story. i didn’t know that the slave was burnt with the viking when he died to serve him in the under world!!!!!!!!!!! couldent listen to it,wouldent let me! i didn’t know there was a queen of the gods so thanks storynory!. This story is heart-warming i loved it.if i was to rate this it would be 10/10 for me. please put more viking stories on here thank you. This is what Amon Amarth’s song Töcks Taunt is about. Töcks, in this story is Pokk. I wonder which is the correct spelling… Great song and great story! it is very good I think it is better than Viking myths it will interested lots of my friend and they will go on it hopefully good luck. I love this story it is sad but fun to listen to i was reading it too.I hope you can listen to the story it is a great story. Hi elizebeth this was sad and very awesome. Thanks for making this for my school. Beautiful Story. Heart Touching indeed. Nice story! I’ve always been a fan of myths. Though Loki may be evil, he’s pretty crafty. Too bad for Baldur. this story is so sad I think that evil giant should be killed so that everyone would weep and baldur would be free . still great story Elizabeth please write more. GREAT STORY GOOD GGOOD AWESOME!!!!!!!!!!!!!!!!!!!!!!!!!!!!!!!!!!!!!!!!!!!!!!!!!!!!!! GREAT STORY GOOD GOOD AWESOME!!!!!!!!!!!!!!!!!!!!!!!!!!!!!!!!!!!!!!!!!!!!!!!!!!!!!! I did not know that Frigga married Odin! I liked it a lot. It was brilliant!!!!!!!!!!!! Horibal story my brother says . I say LLLLLOOOOOVVVVVEEEEE this SSSTTTOOORRRYYY !!!!!!!!!!!!!!!!!!!!!!!!!!!!!!!!!!!!!!!!!!!!!!!!!!!!!!!!!!!!!!!!!!!!!!!!!!!!!!!!!!!!!!!!!!!!!!!!!!!!!!!!!!!!!!!!!!!!!!!!!!!!!!!!!!!!!!!!!!!!!!!!!!!!!!!!!!!!!!!!!!!!!!!!!!!!!!!!!!!!!!!!!!!!!!!!!!!!!!!!!!!!!!!!!!!!!!!!!!!!!!!!!!!!!!!!!!!!!!!!!!!!!!!!!!!!!!!!!!!!!!!!!!!!!!!!!!!!!!!!!!!!!!!! What a sad story.If it happend to me I would let that person burn underground! Good story! But a bit sad. I liked the story, but the brother was very bad! I felt sad! BERTIE PLS MAKE MORE SHERLOCK HOMES STORYS! Oh, those poor Norse gods! May Odin always look after them! Baldur, may you be set adrift in a peaceful realm like Valhalla! It just missed my heart. Needs to be sadder! just kick loki’s ****! then he will bring Baldur back to life! it is a vere god store and amzing. love it!!! I’m going to see ‘the force awakens’ star wars. great story it sounds like the start of marvel. Baldur is kinda a Mary Sue- and I suppose that’s why Loki decided to kill him. After all, Loki is the god of mischief and chaos- Baldur is the god of innocence and light. Or Loki was jealous of the attention. In the old myths, Loki would do anything for attention. I already knew this story. Boring!!!!!!! Great story it is amazing and aswsom yeah. I love it so much and thank you for reading this to me. The story was really really GOOD if you read it you will like it and it is really sad story at the same time. love u guys more norse myths!!!!!! Wow, that was very touching. So very sad. yeah but what happened to Hodur after his brother died? this story is so sad. I think i can tell my teacher to show it to my class. thank you, storynory for that great story. I love this story! Amazing job. Love how sad it is, that’s my style! This story reminded me of a turtle, so I like =d it! great story good good awesome! You’re welcome.. Well done Anon! The first story I read in storynory.com, really great! nice story. Could have been more gory. I give this story 10/10!!!!!!!!!!!!!!!!!!!!!!!!!!!!!!!!!!!!!!!!!!!!!!!!!!!!!!!!!!!!!!!!!!!!!!!!!!!!!!!!!!!!!!!!!!!!! Amazingly sad and amazing! I love it! It’s not ‘Pokk’ it’s ‘Þokk’ (pronounced thock) written with the letter thorn (Þ,þ). I hope you fix this minor mistake. Why does Loki hate baldur? And why for what reason did he kill him? I enjoy these very much. Once, sometime ago, I read a story about this death of Baldr. Frigg asked all to bless him , everyone did except mistletoe, after Baldrs death Misteltoe wished to know why the skies were gloomy now to which she was told that it was Baldr who kept the days bright. Mistletoe was so distraught she came to be known as a plant that all shall kiss under. He should have used the infinity stones! So laaaame this story ain’t sad what du frik! !